Welcome to ProTom, where fitness is fun, and the only person pushing you…is you! Well, for most people what’s really missing is motivation; we want the results of getting fit and feeling wonderful, but we can’t bring ourselves to make the effort. We know we need to, we just don’t have sufficient “have to” to get on with it…and we worry that, having started we won’t stick to it. 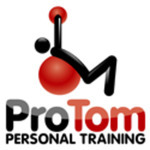 That’s where ProTom is completely different, because what Tom Lakos does is work with you both mentally and physically to make getting fit fun and easy.